The following is an excerpt from Florian Vetsch's Desultory Correspondence: An Interview with Paul Bowles on Gertrude Stein. (Sporadische Korrespondenz: Ein Interview mit Paul Bowles über Gertrude Stein). Memory/Cage Editions, Zürich 1997. It is the result of two interviews which took place on March 1, 1995 and January 1, 1996 in Tangier, Morocco. The remaining questions were cleared up in writing. FLORIAN VETSCH: How did you come across Gertrude Stein's work? 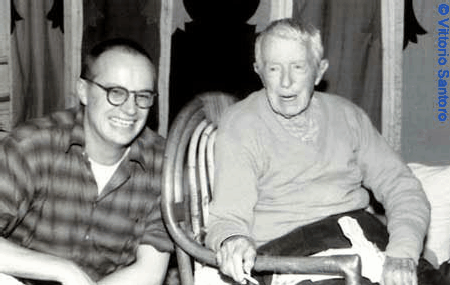 PAUL BOWLES: When I was in high school I had an English teacher, and I remember one day she said to one of the students, "You are not James Joyce, and you are not Gertrude Stein! You must write proper English and pay attention to punctuation." So I began thinking, "Who is Gertrude Stein? And what does Miss Harding mean by telling us we are not Gertrude Stein?" I had never heard of her. Then I used to go up and down Sixth Avenue looking in second-hand bookshops. They used to be there in the mid-Twenties, a long time ago, seventy years ago. I found a magazine there called transition, and I bought a copy and took it home. It was published in Paris, and it had something of Gertrude Stein's in it. I think it was called "As A Wife Has A Cow: A Love Story". It made no sense, so I thought, "That's wonderful. There you can publish things that don't make any sense at all and not even in proper English." And I thought that was fun, and that's how I first read Gertrude Stein. VETSCH: What did Gertrude Stein's writings mean to you before you met her? BOWLES: Well, it was like a signature of a crazy woman that I thought was wonderful. Because I was out for crazy people. I thought a good writer must be crazy. Not really crazy, but I mean different, original, not like other people. And I never forgot her, I remembered her name always. And when I was in college in 1928, Bruce Morrissette, a friend who was at the University of Richmond and was the editor of their literary magazine, The Messenger, had the idea of turning over a whole issue to me and I would collect material principally from avant-garde people. So among those to whom I wrote was Gertrude Stein. And she was very kind. She sent a contribution to the magazine. I heard from Gertrude Stein and entered into a kind of desultory correspondence with her. And the next year, I went to Paris. But I didn't meet her or anybody. I was much too shy and modest, and so, of course, I didn't meet her although I did two years later when I went back to Paris. VETSCH: You were twenty years old when you went back to Paris in 1931. BOWLES: Yes, that's when I met her. VETSCH: How did you make her acquaintance? 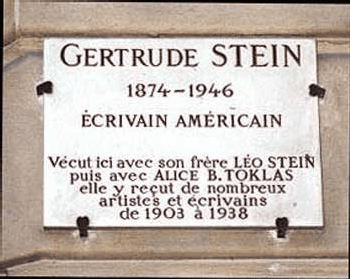 A plaque marks the first Paris home of Gertrude Stein and Alice B. Toklas at 27, rue de Fleurus, where they entertained many artists and writers in their salon. BOWLES: I wasn't so terrified then as I had been two years earlier. I went and rang her bell at 27, rue de Fleurus. And the maid came and opened the door, and I heard voices at the top of a flight of steps in the house. And then someone called and asked, "Who is it?" And the maid said, "It's a man who wants to see you." I don't remember, I think I gave my name. Anyway, she came down. And there she was. She said she was very surprised to see me, because she thought I was at least seventy from the letters. It never occurred to her that I was so young. She didn't mind. I think she thought it was funny, amusing. And then Miss Toklas came down, and we began to talk. And she said, "You must come to dinner tomorrow night. Because I'm going to have Bernard Faÿ here." He was a friend of hers. And he was the head of a department at the Sorbonne called "Franco-American Relations." He was always going to America, and so he knew America very well. He came, and I met him. We had dinner the following night. VETSCH: What happened at that dinner? BOWLES: Nothing. There was Bernard Faÿ there and that's all as I remember. There were just the four of us. And I remember she said, "We have to 'lancer' Freddy." That's me. But I wondered what it would consist of, being "lancé". I never found out. VETSCH: What did Gertrude Stein mean by that expression? BOWLES: I would say that she would exhibit me. BOWLES: Yeah. When you "lancer" somebody, you start the career, you might say. BOWLES: No, nothing. Well, of course, I left. I always left everywhere. So she couldn't very well have "lancé-d" me. I wasn't there. VETSCH: Do you have an idea why Gertrude Stein became an expatriate? BOWLES: No, I don't, but I think she discovered she could live much better on her small income in Europe than she could in America. That's why most Americans became expatriates. It was financial. VETSCH: Do you know why she preferred Paris? BOWLES: No, but I assume that she assumed that Paris was the center of the world. It was, of course. Everything went on in Paris. The new music was there, the new literature was there, the ballet was there. Everything that was avant-garde was in Paris at that time. VETSCH: What was her lifestyle in Paris? BOWLES: I have no idea. I don't know. I wasn't with her day and night, you know. I was there when I was invited. But she worked. She worked every day. She dictated her works to Alice Toklas, who wrote them down. She lived like anyone, more or less. She went out to market, bought food. She had that awful dog. She had to take it out for a walk all the time. BOWLES: Mhm. There was Basket the First. Each had a Roman numeral after its name: There was Basket I and there was Basket II and there was Basket III. I don't think they went further than that. Of course, the name outlived the beasts. VETSCH: Would you please describe her apartment at 27, rue de Fleurus? BOWLES: Oh, I can remember it, yes. There was the door that would lead into the courtyard. And that was the entrance, the front door to the flat. And in front of the door there was a staircase that went up to the next floor. I never went up there. That was apparently, that was probably the bedroom and bathroom and so on. I don't know, but it must have been. And then there was a big room full of furniture and paintings, many paintings on the walls. Most of the paintings were by Picasso, not very big. She had bought them from him directly over the period of a year or two, I don't know. They were very cheap. She told me, I think, she had paid 1,000 francs a piece for a painting. That's not very much. I mean in those days that was equal to about 40 dollars. He liked to sell them, I suppose. And she was very fond of them. She also had paintings by Juan Gris. Very nice. The room was absolutely full of paintings, almost every inch on the wall was covered. And off that room there was a smaller room which was the dining room. The kitchen I suppose was next to the dining room, but I didn't see it, I never went into it. It's hard to describe the apartment. It had big pieces of furniture in it. I don't know much about furniture; I think it was old. I know she was very incensed with Ezra Pound, because whenever he came to the apartment he broke something. He would sit on a chair, and it would collapse. Of course, he sat down very hard and they were antiques. And also he would move, and a lamp would go over and break. So she finally said, "You can't come any more. I can't afford to have you in the flat. It's too expensive to repair the damage." He didn't mind. 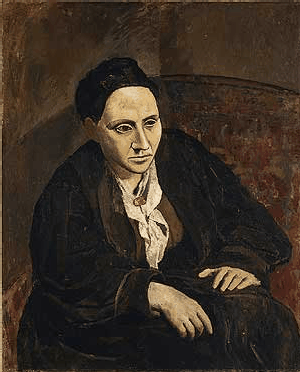 VETSCH: Who was Gertrude Stein's favorite painter in 1931? Was it still Picasso? VETSCH: Because he had made that famous portrait of her in 1906? BOWLES: Oh yes; it was in the room. It was done from memory. I mean he painted her, and then he took it home and looked and didn't like the face, and he painted the face out. Then he decided to paint her as he remembered her, but not as she looked. That's how he made the famous painting, I think. Because the face is in a different style from the rest of the painting. The rest was done from life, but the face was done from memory. That's what's interesting about it, I think. VETSCH: In her Autobiography of Alice B. Toklas she wrote that Picasso once said about this painting, "Everybody says that she does not look like it but that does not make any difference, she will." Do you think she resembled her idealized portrait? BOWLES: Yes, I think she did. VETSCH: When I look at the photographs of Gertrude Stein and Alice B. Toklas, I see Alice always in the background, like the servant of a genius. And the genius is Gertrude, an eccentric royal child, always featured, standing in front of Alice. But in her biography, Gertrude and Alice, Diana Souhami claims that Alice could be very self-confident, determined, even belligerent, and that she actually embodied the power behind the throne. VETSCH: Wasn't she a little shy? BOWLES: Oh no. Well, she remained in the background for Gertrude, as a favor, you might say. Because she knew that Gertrude liked it that way. She was the important one. Toklas provided the background. But then, as soon as Gertrude Stein died, Toklas became very talkative. She changed completely. Because when Gertrude entertained—when she was alive—she always divided the room where she was giving tea, serving tea, into the women's section and the men's section, like in Morocco. And she was always in the men's section, talking to the men. And Toklas remained with the wives and girlfriends. Stein was with the men. As if Toklas couldn't really have discussed with them what Gertrude could discuss: her work, whatever, politics, I suppose. Gertrude liked to talk. And with Toklas often they were discussing recipes, cooking recipes, she and the women. Well, it was very amusing to see how it always happened. VETSCH: You had the chance to hear Gertrude Stein reading her work. How did she read? BOWLES: It sounded completely sensible, always. The voice, the intonation. It sounded like anyone reading something very serious. But she had a very expressive and very low voice. She had a beautiful voice; she read her own things beautifully. And I always felt that she must have rehearsed beforehand. She knew exactly how to read any line, like a good actress. VETSCH: Did she ever speak to you about the methods she employed in her writings? BOWLES: Well, yes, she used to say that people thought she wrote for the sound but she really wrote for the meaning, for the sense. And that was just what people thought she didn't have, it didn't make sense. But she said, "Yes, it does. You have to read it carefully and it does make sense. That's why it's written." That intrigued a lot of people, because they didn't believe a word of it. I can see why. You cannot find a sense. She said, "It's right there. You just have to work at it." VETSCH: Did she ever talk to you about her prerequisites for writing? BOWLES: She said she liked a landscape. She liked to sit in front of a landscape but not facing it. With her back to it. She had a beautiful view from her garden but she never looked a it. VETSCH: That must be the garden at Bilignin where Gertrude Stein and Alice B. Toklas used to spend the summer. It was this landscape of the valley of the Rhône that impressed Gertrude Stein deeply. BOWLES: Yeah. She liked beautiful landscapes, but she didn't want to sit looking at them. She saw them, and then she knew they were there, and then she sat facing the other direction. Very perverse. VETSCH: Maybe she appreciated the aura of the landscape. BOWLES: She described it, but in her own way. No one would know it was a description of a landscape. Well, she reacted favorably to that landscape. She loved it. That's probably why she rented the house in Bilignin. She had this wonderful view. VETSCH: Would you please describe the landscape she loved most? BOWLES: Well, the house at Bilignin was high. And there was a wall, and then below there was the valley of the Rhône. What one saw was a pastoral landscape—it was pretty—with trees, poplars I think, they're very French. But in the other direction, if you went down into the valley, you would look toward the east and you could see Mont Blanc and the Alps. Very pretty. VETSCH: Could you see the permanent snow of the Alps? BOWLES: Well, far away, of course, it was not very near. It had to be clear weather. Well, it was. It was summer when I was there, and we had very good weather. VETSCH: How long did you stay there in the summer of 1931? BOWLES: Only two weeks in Bilignin. I had to exercise that awful dog of hers every morning. BOWLES: Yes, run with him in the garden. It was ridiculous. But that's what she wanted, and I was her guest. So I had to do what she wanted. Oh, I didn't bathe the way she wanted me to, no, I pretended, because the water was ice-cold. And I don't like ice-cold water. I like it for drinking. But I don't want it over me, no. Well, I wasn't used to it. I never had it. In America one had hot water for bathing. VETSCH: Didn't Gertrude tease you a little? BOWLES: Well, a little. I don't know what about. It had to do with that awful dog of hers. VETSCH: Was she very imperious? BOWLES: If she gave orders? Oh yes, very much. VETSCH: Hemingway said somewhere that she reminded him of a Roman Caesar. BOWLES: Well, yes, she did somehow look like a Roman emperor... He didn't like her it seems, finally he didn't. They didn't remain friends. And he wrote very nasty things about her in the Moveable Feast. Yeah. I think he should have remained loyal to her. After all she helped him a great deal when he was young. After he became famous, he decided that she was no good, that she was a farceur, a charlatan... Well, he was wrong. He had no reason to think that, certainly no reason to write it in a book. VETSCH: She was certainly not a charlatan. Right from the beginning she belonged to the avant-garde and was a determined author. So very, very early she wrote experimental literature. BOWLES: Absolutely. I remember she wrote something in Tender Buttons: "A little lace makes boils." And I was visiting the Comtesse de Lavillate. I told her because from the Château de Lavillate I was going to Bilignin. And she said, "What does this woman write?" I said, "Well, she writes surprising verse." Then she said, "Well, tell me something." And I said, "I remember one sentence: 'A little lace makes boils.'" And so I said, "Un peu de dentelles, ça fait des furoncles." And she said immediately, "Ah oui, et la broderie anglaise, ça fait des pustules." And I told Gertrude Stein that. And she said, "Ah! You see why I love the French. They're so quick. They play a game quickly. And you won't find English people or German people the same way at all. Only the French." I suppose that's true. I mean I can't imagine an English woman saying, "Ah yes, embroidery makes pustules." No. Only, "la broderie anglaise ça fait des pustules." VETSCH: I read somewhere that she used to repeat your name all the time. She would just sit there and say, "Freddy, Freddy, Freddy..."
BOWLES: She would repeat my name over and over and over? Well, that would be very strange to repeat the name of someone who was right there in front of you, and keep saying it. If she was talking to me at table, maybe, and didn't agree, she might say it three times, "Freddy, Freddy, Freddy." Yes, but not saying it over and over again because she was talking to me, yeah. VETSCH: At least she had that famous weakness for repetitions. And the most famous repetitious verse of hers is "A rose is a rose is a rose is a rose." BOWLES: "Rose is a rose is a rose." There are three. She knew some farmers between Bilignin and Belley. And they had a daughter; her name was Rose. And she used to go by and see them. And then she said at some point or Toklas said, "Rose is a rose," meaning a lovely girl. And then I don't know why the third one came in. Apparently she considered the sentence also to be a rose. Therefore "Rose is a rose is a rose." VETSCH: That's interesting. But nevertheless there is a fourth rose. BOWLES: I never saw that. She had some stationery. On it it had a circle embossed in silver. There it had "Rose is a rose is a rose" in a circle—but not four. And underneath it said "27, rue de Fleurus". So I don't remember, I don't know where the fourth came up or where it was used. The title of John Malcolm Brinnin's biography of Gertrude Stein was The Third Rose (Little, Brown, 1959). VETSCH: Yes, this is an excellent book on Stein. In her so-called "Piece", Sacred Emily, from 1913, a very free poem, typical of her experimental style, there we can find this sentence for the first time in her writings. There she wrote "Rose is a rose is a rose is a rose." Later she even changed the verse in "A rose is a rose is a rose is a rose." BOWLES: Four times? I couldn't say why. VETSCH: Maybe that's exactly what she wanted: to write a sentence free from any reference, to produce pure poetry. BOWLES: She had another one, also having to do with farmers' girls living in the neighborhood, and they were twins named Lily and Louise. And she wrote a sentence which said, "Nobody knows the difference between Lily and Louise but I do." She was very proud of being able to distinguish Lily from Louise. Because even their parents couldn't. They were identical twins... "Nobody knows the difference between Lily and Louise but I do." It's funny. Used with the permission of the author. All rights reserved. FLORIAN VETSCH was born in 1960 in the Rhine Valley of Switzerland. He studied German literature, philosophy, and criticism and wrote his thesis on intercultural aspects in Martin Heidegger's work (Martin Heidegger's Angang der interkulturellen Auseinandersetzung, Königshausen & Neumann, Würzburg 1992). Dr. Vetsch has traveled in Italy, Greece, Egypt, Morocco and elsewhere. He lives in St. Gallen, Switzerland, where he teaches German literature and philosophy. Vetsch is a freelancing contributor to several literary magazines and newspapers and has translated poetry by Paul Bowles, Ira Cohen, Jack Hirschman, Lawrence Ferlinghetti, Mark Strand and Anne Waldman. As an editor he brought out the Allen Ginsberg special issue of the literary magazine "Der Sanitäter" (Nr. 9, Verlag Peter Engstler, Ostheim/Rhön 2002) as well as a collection of international contemporary poetry under the title Warenmuster, blühend (in cooperation with Alexandra Stäheli; Waldgut, Frauenfeld 2000). 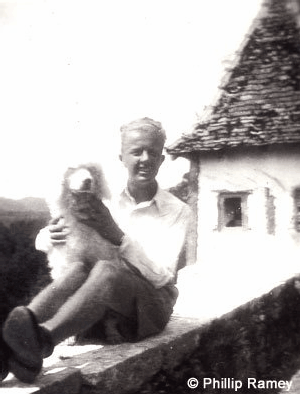 Florian Vetsch has published books of poetry and essays, among them the booklet Antäisches Kraftfeld / Paul Bowles in Tanger (Sabon, St. Gallen 1998). His most recent work is a broad anthology about the literature of the Moroccan city of Tangier, entitled Tanger Telegramm (in co-operation with Boris Kerenski; Zürich: Bilgerverlag, 2004).